Mt. Kilimanjaro, the highest summit in the entire continent of Africa, is no more technical than putting your left foot in front of your right foot. The challenge is the altitude. At 5,895 meters (19,340 feet) above sea level the air is noticeably thin. We woke shortly after midnight at 4,600 meters (15,091 feet) on our fifth day of climbing. Barafu Camp or “Ice Camp” (as translated from Swahili) didn’t have any ice or snow as I’m sure it once did. It is now a barren pile of jagged, naked talus rocks. Yesterday, we marched through a thick fog, giving cause for concern regarding what kind of view we would get from the summit. But as we emerge from our tents to a cloudless, star-bejeweled sky, our concern lifts just as the fog did overnight. It wasn’t quite freezing out, but it was close as we nibbled down some breakfast bars and hot drinks and packed our bags for our summit push to the roof of Africa. 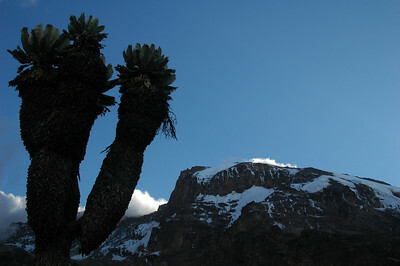 Tanzanian law requires that each party going up Kilimanjaro have a guide and porters. This took a little getting used to. I have always carried all of my own gear while out in the backcountry. At times it felt like an early 20th-century British Royal Geographic Society expedition. A staff of twelve including guides, cooks and porters supported our group of four. That actually put us at the relatively modest ratio of 3:1 while the higher end guide options take up to five supporters for each client. The twelve of us never traveled together in a big herd, though at times the many groups would bunch up on the trail. It’s a big mountain but it was rare to have any part of it totally to oneself. Each morning after having our breakfast prepared for us, we packed our big bags for the porters to take, shouldered our day packs and left our tents for the porters to dismantle and bring along. I never did get used to walking away from a camp like that. Admittedly, it would have been very difficult do the trip in six days without the help. With only light day packs, we acclimated much faster than under the strain of a full pack. In which case, the trip would have been longer than six days, so we would have needed more food, which would put more weight on our backs making it longer to acclimate. Somewhere this equation does balance out, but we didn’t have to worry about that. Nelson, our head guide set a slow and steady pace to help us acclimate. Once the porters had camp packed up they would catch up to us, pass us, and have our next camp all set up by the time we got there. It wasn’t uncommon for hot drinks to be ready as we arrived. Camp consisted of two client tents, two large staff tents and a purple dining tent with a folding camp table and four camp chairs. For the summit push on the fifth day (remember, we’re starting around midnight), we only had three support staff consisting of Nelson, our head guide and two porters. I set up my camera to capture a long exposure in the dark of some of the activity of camp as we prepared ourselves for the summit. Though, it seems someone managed to bump into the camera and it shows in the image. At first glance, it looks like a bit of a mess of a photo, but a close look does show the bevy of activity around camp: streaks of headlamps crossing the frame, tents aglow and the super highway of climbers ascending before us up the ridge towards the stars spinning around the summit. The initial climb out of camp traversed a steep and rocky trail. The dust and rocks crunched under our boots in the small world created by the circle of light from our headlamps. Beyond that, infinite darkness surrounded us save the pinpoints of starlight above us in the dark sky. We had to deal with some fairly steep terrain our first day. Starting at 1,800 meters (5,900feet) the air was still relatively thick and we could get away with exerting ourselves. We climbed up through the lush foliage of the African montane rainforest. Banana trees near the start of the trek yielded to different kinds of moss draped branches, hanging vines and a thick ground cover of ferns and flowers. The temperature was pleasantly mild, (16C/60F) for being only three degrees south of the Equator. Between 2,000 meters and 2,300 meters we climbed through a thick cloud layer and didn’t pop out from under the dense tree canopy into the clearing among the spiny Erica (Heath variety) trees until we reached our first camp just short of 3,000 meters. After the first day, Nelson really slowed the pace down. And now on the dark summit push, heading up the lunar like scree-covered surface of the summit cone, Kibo, we practically crawled to give our bodies the best chance at dealing with the much thinner air. Because we were moving so slowly, I was still wearing my heavy down jacket and was very comfortable in the freezing air. I often turned my headlamp off and let my eyes adjust to the darkness around me. Neither of the porters had headlamps. Between the slow pace and the ambient light spilling out from the headlamps of others we could read and handle the terrain just fine. This opened a whole new world beyond the blinding orb of light created by my own lamp. I could now actually see the mountain blocking the stars. It was like someone had torn away a piece of black construction paper to the shape of the ridge to reveal the stars above. It felt like a lifetime of wallowing in the darkness before nautical dawn provided any hint of light along the horizon. Realistically however, it was around 5am when I turned around for a hopeful glance at the dark world below and saw the faint bars of twilight. The silhouette of Mawensi, the second highest of the three volcanoes that make up Kilimanjaro, was just poking through the sea of clouds that had been below us ever since we hiked through it on the first day. As the faint glow from the east strengthened, subtle shadows of the rough terrain would sharpen, giving more and more definition to the surface of the landscape around us. Finally, the orange beams of sunlight reached over the horizon and pierced through the thick equatorial air to illuminate the side of the mountain with a spectacular golden glow. The higher we climbed, the colder it got. With the sun came the wind, lightly at first then building, amplifying the cold. The warmth of the sun must have been in the mix somewhere, but I didn’t feel it. Though, there was psychological value with the light and I appreciated having the world open up from the concealing darkness of night around me. A thin cloud blew onto us, scattering the sunbeams completely changing the quality of light and the entire barren and steep rock strewn scene. The shadows disappeared and we were no longer walking on the orange rocks, but through a glowing golden haze. The orb of the sun was just visible through the vail of cloud above us. When we crested the rim of the crater, nearly 7 hours (7am) after we started ascending, the full force of the icy wind pushed firmly against my body. Fortunately, the cold did not penetrate my many layers. The group gathered together behind a small leeward lip of rock to rest at Stella Point (5,756 meters). We only had to walk the relatively gentle grade of the rim of the crater to reach the true summit, Uhuru Peak, Freedom Peak. The going continued to be slow. The slope and rate of climb was much less severe compared to the push this morning, but the freezing wind was relentless. Clothing, hair, anything near or around our faces became frosted as the moisture in our breath froze instantly to anything it could latch to. But the lung-squeezing air and bitter wind was worth it when the cloud around us blew on to reveal the massive glaciers surrounding the crater rim. The huge walls of ice and snow forming the end of the glacier were decorated with massive cathedral columns standing like organ pipes bunched together. Beyond the glacier, a sea of clouds encircling the mountain made it look like the glacier pushed out to the horizon and floated over Africa. Eating didn’t really cross our minds as we pushed through the wind on our way around the crater rim. The upper level clouds continued to blow by. At times we would get some direct sunlight, other times we would be in or under their grayness. There was even a cloud that sat in the crater itself, camouflaging the crater floor. The clouds lifted again for a moment, and there, along the trail was a gathering of people in puffy jackets with warm hats and hoods. They slowly shuffled around, the sign that marks the summit of Mt. Kilimanjaro. We made it. As is common with volcanoes, the summit of Kilimanjaro is not much of a peak. The highest point of the crater rim, the de facto summit, is a large flat area where the many who have accomplished this before have worn the rocks into a dusty trail that abruptly ends at the sign. Summiters mill about, most in a combined daze from exhaustion and the thin air. They’re basking in the accomplishment and patting each other on the back while waiting for their turn to get a summit photo at the sign. All around, a sea of clouds blanketed Africa below. The sun continued to rise as we start to descend. Eric’s level of consciousness had dropped a notch or two, most likely due to the thin air. He’s normally a pretty quiet guy, so I didn’t notice this until he was getting a little clumsy with his trekking poles. I got him to talk out loud to really think through what he was doing. “Left, right, left, right” to help him remember to move his trekking poles with his feet so he wouldn’t trip over them. Going down was the best thing we could do for him. The only other altitude issue our group had was when Amy got nauseous just a few hours earlier on the summit push. She donated her breakfast to the side of the trail and continued on. Determined to summit, her father, George, kept a supporting hand on her back all the way to the top. It was a joyous emotional moment for them to reach the summit together. The clouds won out in the end and we descended through a thick fog back to Barafu Camp where we had left our tents over 10 hours ago in the dark. We collapsed into our nylon shell of an abode and Striker, our ‘waiter’ as they described him, brought us some juice and food. I had to convince Eric to get some food in him before he fell in the lure of sleep. For the first time since we arrived in Africa, it really started to rain, or snow, or something. I just could hear the constant patting and tapping on the tent fabric through my hazy cocoon of sleep. Around 1pm Striker brought some more food around and we started to get everything packed up to continue down to our last camp. The last remnants of precipitation which turned out to be gropple, a mix of sleet and hail, was scattered on the dampened ground around our ‘ice’ camp. While we zigzagged our way up the mountain to acclimate, we made a beeline straight down the mountain to exit. Eric was doing much better after the nap and continued to improve as we tromped down into the thicker air. It was a pounding gravity-assisted descent. Our daypacks were cinched tight to our backs. A small patch of rain did not slow us one bit as we worked our way down the steep slippery slope. We sped through the many eco-zones from the barren scree of the summit cone into the alpine desert where the vegetation started to crop up. First as stubby shrubs then into the spiny Erica trees of the moorelands and finally down into full, bold, mossy trees of the lush rainforest glistening wet from the recent rain. We also descended through the layer of clouds we saw from above just hours ago. The next morning, our team of porters sung for us the classic “Kilimanjaro Congratulations Song” before we made the last push off the mountain. It was at this point, after the song and dance that we were asked by our guide to declare what we were going to tip each of the porters, cooks and assistant guides of our group. This was a little awkward. We quickly glanced around at each other in bewilderment. The support team just stood there as we huddled in one of the tents to sort out what we had brought with us and how to properly divide it up. Because of corrupt guides in the past, before the porters and guides association, Nelson ran a totally transparent operation and wanted his porters to know what was coming to them as declared by the clients. A little heads-up the night before would have been nice for us to sort it out before now. We were very happy with all the work they had done and they were grateful for what we could give. The last leg of the trek continued down the steep trail through the rainforest, sometimes passing other trekkers on their way out, often being passed by porters keen to get home after this stint of employment. Like the clouds that parted to reveal the glaciers at the summit, so did the lush canopy of trees open as we entered the parking lot where our ride awaited us to take us back to the hotel to wash, celebrate and rest. We went with an outfit called Kinyonga Tours & Safaris out of Moshi, and they did a great job. This entry is filed under: Africa, Earth, Hike, Seven Summits, Story, Video. I found your presentation at REI-Boulder quite informative, especially now that I am actually planning a trip to climb Kili myself! Thanks for sharing your helpful insight and photographs. Thanks Deborah! Be sure to let us know how your trip goes! Thanks! Be sure to try the Acai Bowl there. A tasty & cool summer treat! I attended your Kilimanjaro presentation at REI Boulder a few weeks ago. It was awesome. I am trying to find the name of the guide company you used, but don't see it on yor website. Can you send me the name of the company please. Thanks.